Is Peanut Butter Toxic to Dogs? Many owners and trainers give dogs peanut butter as a reward for good behavior. It’s a delicious and versatile indulgence that can also be used for distraction, training purposes, and entertainment. Most canines enjoy the rich and creamy taste! Is peanut butter dangerous for dogs? It is usually a safe dog treat, but never give your dog a brand that contains a substance called xylitol. This will often be a sugar-free brand with xylitol as a replacement. This ingredient is hugely toxic to dogs and consumption can be fatal. Make sure that you check that the peanut butter you feed your dog is xylitol-free! Other than sugar-free peanut butter being a health risk for dogs, there is more to this product that all owners should know before they liberally provide it as a treat. This guide will discuss the varied uses of peanut butter and how it can be consumed safely. 1 Why Do Dogs Like Peanut Butter? 1.1 Is Peanut Butter Good for Dogs? 1.1.1 Can Puppies Eat Peanut Butter? 1.3 Are Dogs Allergic to Peanut Butter? 1.4 Can Peanut Butter Cause Diarrhea in Dogs? 1.4.2 Are Reese’s Peanut Butter Cups Toxic to Dogs? 1.5 Why is Peanut Butter Fed to Dogs? 1.6 Which Popular Peanut Butter Brands are Safe for Dogs? 1.6.1 Is Jif Peanut Butter Safe for Dogs? 1.6.2 Is Skippy Peanut Butter Safe for Dogs? 1.6.3 Is Peter Pan Peanut Butter Safe for Dogs? 1.7 Are Any Peanut Butter Brands Unsafe for My Dog? 1.8 How Do I Make Peanut Butter for Dogs? 1.10 What Are the Alternatives to Peanut Butter? Why Do Dogs Like Peanut Butter? From the moment you open the jar, your pet’s fantastic sense of smell will pick up the distinct aroma. A scent that, thanks to the roasted fats and proteins used in the manufacturing, brings thoughts of caramelized meat to your dog’s mind. As though that wasn’t enough to get a dog’s mouth watering, there is also the taste. Peanut butter is loaded with sugar and sodium, which may not exactly be considered health food by any guru but will be like manna from heaven for a hound. After all, these tastes are not part of their natural diet and will provide all kinds of new sensations on a dog’s palate. Finally, never overlook the fact that peanut butter can be fun for a dog to eat. Pop a teaspoon into the jar and hold it out to your dog. After their eyes have widened and they have created a tornado with their tail wagging, your pet will lap contentedly at the spoon until it’s licked clean. You’ll no doubt get the puppy dog eyes in response to this asking for more, but try to resist that particular appeal – peanut butter should always be kept as an occasional treat. Is Peanut Butter Good for Dogs? Peanut butter will not top the list of vet-recommended health foods, but it has its benefits. As the American Kennel Club explains, the product can be a great way to get protein into your dog’s routine, as well as adding good fats to their diet. However, there is a flipside. No, not the potential presence of xylitol – though we will be banging that drum quite substantially, as it is hugely important. No, we are referring to the sugar and salt found within traditional store-bought peanut butter. Sure, these are the ingredients that make the treat so tasty for your dog, but they can also play havoc with their weight, causing obesity and the risk of canine diabetes, and rot your pet’s pearly whites. 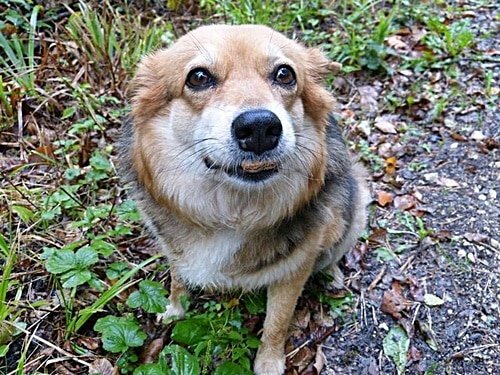 Indeed, if peanut butter is going to be a regular feature of your dog’s diet, you’ll need to start getting them used to having their teeth brushed. One way around this is to pick up a natural or low-salt product or to make your own peanut butter at home. Overall, peanut butter is fine in moderation. Treats should be just that, though – treats. Peanut butter, and any meal or snack that contains it should never amount to more than 10% of your dog’s daily calories. Can Puppies Eat Peanut Butter? Yes, they most certainly can – and in fact, they are more likely than ever to be compliant when you offer such a tasty reward as part of a puppy’s education! The frozen peanut butter in a Kong trick, for example, will keep your puppy amused while you are crate training. Just be careful about getting your pup hooked on peanut butter at too young and impressionable an age. While your dog’s body is still developing, they will be more vulnerable than ever to the side effects of salty and sugary treats. Too much fat will also cause an adverse reaction for your pup. In addition to the salt and sugar content that’s found in non-organic peanut butter, Dogs Naturally Magazine caused quite a stir when they posted an impassioned objection to owners feeding the product to their pets. Peanuts contain aflatoxins, which have been linked to cancer. Many types of shop-bought peanut butter are packed with trans fats. The sugar found in shop-bought peanut butter can feed bacterial infections in your dog. It’s down to you as to how much stock you place in these concerns, but it certainly pays to read the article and make sure that you understand all different sides of the argument. Naturally, making your own peanut butter (or purchasing an organic product) can also avert two of the three complaints profiled. Incidentally, The Smart Canine has a counter-argument that claims that peanuts are good for dogs. Are Dogs Allergic to Peanut Butter? Most dogs enjoy lapping at peanut butter. Alas, just like humans, some canines are allergic and will experience a reaction to the product. This may take the form of anaphylactic shock or a reaction that manifests upon the skin. Take a look at our guide to allergic reactions in dogs to gain more insight into how to handle such a situation. In the event of any of these symptoms, make an appointment with your vet to be on the safe side. It’s quite possible that you’ll be able to treat the symptoms yourself using the advice in the guide that we previously linked, but a medical professional will probably want to run a handful of tests to be on the safe side. Can Peanut Butter Cause Diarrhea in Dogs? 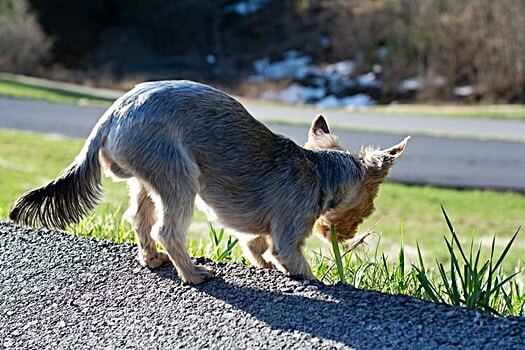 Anything can cause diarrhea in dogs if fed to excess, or if your dog has an allergy or sensitivity to it. Peanut butter is no exception to this rule, so if your dog has diarrhea after you’ve fed them a teaspoon of the stuff, you should probably think twice before repeating the trick. Dogs with delicate stomachs are particularly at risk of an explosive rear end when they indulge in peanut butter, so make a judgment call as to whether your pet can handle the indulgence of so much sugar, salt, and fat! Remember, organic brands or making your own peanut butter could be a way around these complications. Dogs with sensitivities could experience other side effects after eating peanut butter, which can include stomach cramps or vomiting. These are usually related to allergies to the peanuts themselves, or another ingredient found in the product. If in doubt, have a chat with your vet and ask them to run some tests that will help you assess what your dog’s body may be struggling to process and absorb safely. Peanut butter should be a treat for Fido, not something that leaves them doubled over in discomfort. Are Reese’s Peanut Butter Cups Toxic to Dogs? If your dog is a fiend for peanut butter, but your jar is empty, you may be tempted to toss them a handful of Reese’s Peanut Butter Cups instead. After all, the same line of treats was good enough for E.T. so it’ll be fine for Fido, right? Wrong. If your dog breaks into your kid’s Halloween candy stash and eats one or two of these treats, they should be OK, but you may want to get them checked out by a vet just in case. Never offer them though, or allow your dog to get a taste for Reese’s Peanut Butter Cups. These sweets contain traces of chocolate. One of them alone isn’t usually enough to do significant damage to your dog if they happen to find it on the floor, but it’s a fine line that isn’t worth attempting to walk. Why is Peanut Butter Fed to Dogs? Bribery. Try smearing a little PB on the wall of the tub if your dog hates baths and they may be less reluctant to hop in. 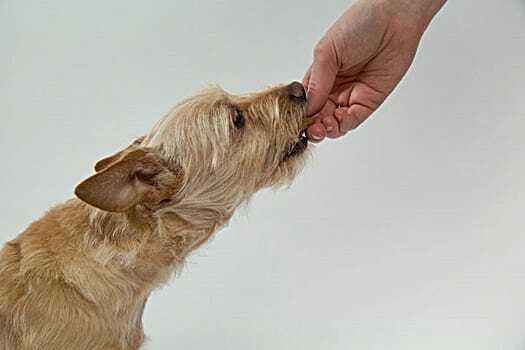 If your dog tends to be aggressive and needs a muzzle, pop some peanut butter on the tip to make the experience more agreeable. Distraction. If you’re going to be out for a while and don’t want your dog to wail, you should fill a hollow toy with peanut butter. Many dogs will spend hours happily licking away at this. If your dog is a fussy eater, you could also mix a little peanut butter into their meals to convince them to tuck in or get a visitor that your dog doesn’t seem taken with to offer a little to your pet. They’ll soon come in for a sniff, and human and canine will be best friends in no time. Which Popular Peanut Butter Brands are Safe for Dogs? Most brands will offer traditional, crunchy or creamy peanut butter on the shelves of your local supermarket. As far as your dog is concerned, creamy peanut butter is the best. It’s the most fun to lick and lap at, and it works great in recipes if you’re looking to make your own treats. Now, let’s assess whether they can be used as part of your dog’s diet. All three of these brands off an all-natural version of their product, which may cost a few more bucks but remains well worth picking up for the sake of your dog’s health. Is Jif Peanut Butter Safe for Dogs? Jif is the most popular brand of peanut butter in the USA, and thankfully it’s safe for dogs too. There is no xylitol in this product, though it is packed with calories and sodium, so remember to use it sparingly. Is Skippy Peanut Butter Safe for Dogs? Skippy peanut butter is xylitol-free and safe for dogs, especially the natural version. The usual warnings about nutrition apply, though – it’s hardly health food. Is Peter Pan Peanut Butter Safe for Dogs? Peter Pan peanut butter caused something of a stir back in 2004 when a salmonella scare led to a product recall, but for more than a decade, it has been perfectly safe to consume for both dogs and humans. There is no xylitol in natural Peter Pan peanut butter. There are other brands available, including imported brands from overseas and supermarket own-brand products. If you decide to pick up one of these, make sure that you check the ingredients listed on the label. Are Any Peanut Butter Brands Unsafe for My Dog? Preventative Vet has compiled a list of peanut butter brands that contain Xylitol. The above products are known to contain xylitol, but that’s no excuse to become lax in checking other products. If in doubt, check with a vet before offering your dog peanut butter as a treat. It’s always better to be safe than sorry. How Do I Make Peanut Butter for Dogs? Put four cups of peanuts into a food processor for around three minutes, which will turn them into a creamy paste. You can then store this in the refrigerator for anything up to four weeks. If you want to add a little texture and flavor, consider applying coconut oil or raw honey. Both of these ingredients are beneficial to dogs, especially the coconut oil, which will magnify the good fats that will boost your dog’s coat and skin. The fact that it makes the peanut butter even more appealing is just a bonus. As we have previously intimated, the easiest way to serve peanut butter to your dog is to scoop up a teaspoon and hold it out, or pop it inside a hollow toy. However, here are some alternative suggestions as to how you can get your dog their peanut butter fix. Place wax paper over a freezable tray or another surface. Mash half a banana and pop it into a bowl with one cup of peanut butter. Apply the mixture to your baking tray and pop in the freezer overnight. You could also apply your mix to an ice cube tray and make peanut butter ice cubes for your pet to crunch on if that is their preference. It never hurts to have a jar of specialist dog cookies in your kitchen when you want to spoil your pooch, or when other four-legged friends swing by for a visit. Preheat your oven to 350O. Lay some wax paper on a baking tray. Mix all of this together and turn it into a dough ball. Lay the dough on a flat surface and flatten it with a rolling pin. Cut the dough into whatever shapes are appealing and suitable to the size and shape of your dog’s mouth. Pop in the oven for 18 minutes. The only trouble you’ll have here is convincing your dog to stop at just one cookie. If your dog has a birthday or adoption anniversary coming up, why not treat them with a peanut butter-based cake? Personal Creations have a recipe that involves peanut butter and pumpkin, two taste sensations that will appeal to any dog. Grease a cake tin – coconut oil is excellent for this when baking for dogs. Grab a bowl and mix up one cup of pumpkin puree, a quarter of a cup of peanut butter, two tablespoons of honey and an egg. Stir a cup of oat flour and a teaspoon of baking powder into this concoction until it forms a batter. Pop this batter into the cake tin, and bake for 25 minutes. You can even make some frosting by mixing another quarter-cup of peanut butter with and half a cup of plain, zero-fat yogurt. 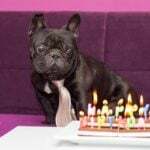 Either way, your dog will love these cakes, which will ensure that their special day is one to remember. Peanut butter is a hugely versatile and favorite treat with dog owners for a reason – it can fulfill all kinds of purposes and will delight a great many pooches. As always though, there can too much of a good thing. Be sure to use the product in moderation. 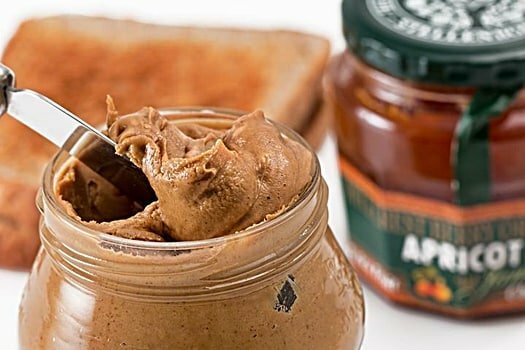 What Are the Alternatives to Peanut Butter? If your dog finds themselves in the unfortunate position of relishing the taste of peanut butter but finding themselves allergic, there are a handful of alternative products that you can look into. Never use macadamia butter – these nuts are poisonous to dogs. If none of the above is suitable for your pooch, you could try offering them a little cream cheese as a treat – most dogs adore cheese just as much as they do peanut butter! Just use this product sparingly, as it can be very fattening. Provided you are vigilant about ensuring that your peanut butter of choice does not contain xylitol or excessive salt and sugar. However, you will be able to use it as a very helpful bribe and delicacy for your dog. There is nothing wrong with treating your dog from time to time. 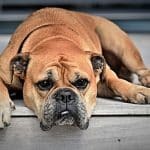 Why Does a Dog Get Hiccups? What Causes Hives on a Dog's Skin?